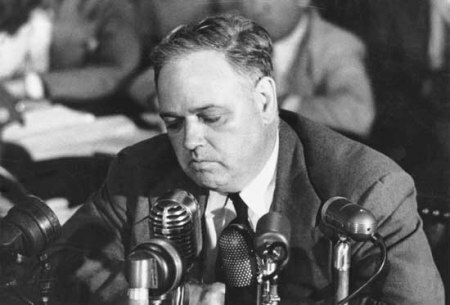 The Whittaker Chambers-Alger Hiss case ripped the veil off the Cold War by revealing that the United States and Russia are both controlled by Freemasons dedicated to the triumph of Communism. Chambers, who had left the KGB ten years previously and was a Senior Editor at TIME magazine, exposed Alger Hiss as a Russian spy and espionage agent. Alger Hiss, who began his career as a student of Felix Frankfurter, had been an advisor to FDR at Yalta, and Secretary General of the UN at its founding conference in SanFrancisco in 1946. Hiss was then President of the Carnegie Endowment for the Preservation of Peace whose directors (and Hiss supporters) included Secretaries of State Dean Acheson, John Foster Dulles and future President Dwight Eisenhower. It also included David Rockefeller and IBM’s Thomas Watson. Do we need any more proof Communism is a rich Satanist’s ruse? Inveterate liars as Communists are, Hiss denied everything until Chambers finally produced espionage material in Hiss’ handwriting. Hiss was sentenced to three years for perjury. John Beresford tells the fascinating story in a series of 36 short lectures (above) and in a typescript here. Chambers’ magnificent book is Witness (1954). Although this would make an incredible feature film, it will never be made. Chambers is a greater patriot than George Washington, but few Americans have ever heard of him. Isn’t that a measure of national enslavement? Cognitive Dissonance: When would a party dedicated to the overthrow of the government and the theft of private property, and the destruction of family and liberty, not be outlawed? When it serves the diabolical agenda of the rich, not the poor.